"It's rare for any bottom-dwelling snails to produce bioluminescence. So it's even more amazing that this snail has a shell that maximizes the signal so efficiently." Indeed, the snail's shell appears to be completely opaque, which one would think would block any escaping light. But the shell actually works to very specifically control how light diffuses from the shell. 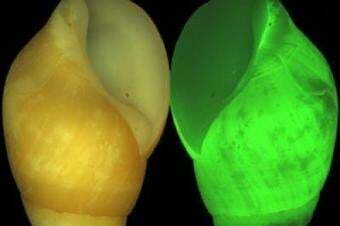 When the snail creates bioluminescent light, its shell makes sure only that particular green color is dispersed. "The light diffusion capacity we see with this snail is much greater than comparative reference material. Our next focus is to understand what makes the shell have this capacity and that could be important for building materials with better optical performance."